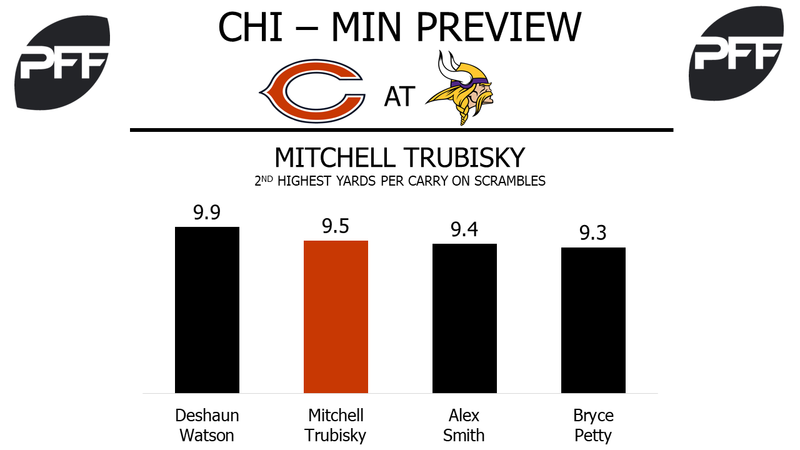 QB Mitchell Trubisky scrambling vs. Vikings defense – Trubisky’s mobile legs have made him more difficult to defend. He has scrambled past the line of scrimmage 24 times on passing plays, and his 9.5 yards per carry average on scrambles ranks second among quarterbacks. In Week 16, he scrambled four times, picking up 39 yards on the ground. Last week, the Vikings’ defense allowed Brett Hundley to scramble four times for 50 yards, and in Week 14, Cam Newton picked up 75 yards on the ground against Minnesota on just eight carries. In Trubisky’s NFL debut against the Vikings, he scrambled three times for a total of 22 yards. RB Jordan Howard vs. LB Anthony Barr – Howard has improved in pass protection this season. He leads all Bears running backs with 50 pass-blocking snaps, and he’s allowed one sack and two hurries. That equates to 6.1 percent of those snaps resulting in pressure, tied for the sixth-best rate among running backs with at least 40 pass-blocking snaps. Barr has rushed the passer more than any other Vikings linebacker, picking up one sack, four hits and six hurries on 90 pass-rushing snaps. He’s rushing the passer on career-low 10.4 percent of his total snaps, and he has not generated a single stop in the last three weeks. OL Cody Whitehair vs. DI Linval Joseph – Whitehair has had to move between guard and center due to injuries on the Bears’ offensive line, but his 74.7 overall grade ranks ninth among centers. He has allowed one sack, six hits and 18 hurries on 514 pass-blocking snaps, after allowing only 14 total pressures all of last season, and his nine penalties this season is the second-most among centers. Joseph has racked up 35 total stops this season, the second-most among defensive tackles. Week 16 was his first game all season in which he did not record a pressure as a pass-rusher, and he’s been flagged a career-high four times this season. 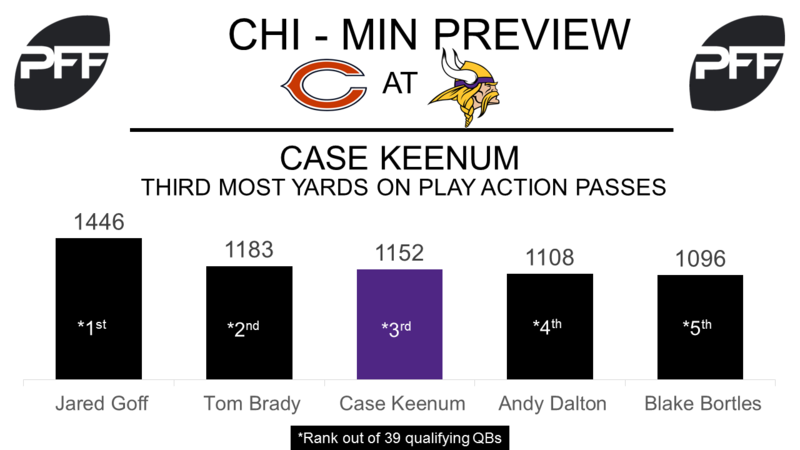 QB Case Keenum vs. LB Christian Jones – Keenum will wrap up a brilliant 2017 season on Sunday and could have a big game against the Bears. He has used play action more than any other quarterback this season at 29.5 percent, and he has taken full advantage of it, too. He currently has the third-most yards off of play action (1152) and is completing the fourth-highest percentage of play-action passes with a completion percentage of 68.7. His passer rating on such passes of 109.4 is the sixth-best among quarterbacks. The Vikings’ top signal-caller could find some success when targeting linebacker Christian Jones, as Jones’ coverage grade of 45.1 ranks 58th among 82 linebackers. Quarterbacks are completing 85.4 percent of their passes when targeting Jones, which is the sixth-highest percentage among inside linebackers, and his passer rating allowed of 112.2 is the 17th-highest. WR Stefon Diggs vs. CB Prince Amukamara – When the Vikings go to 3-WR sets, Diggs will be mostly matched up with a cornerback who is having a career year. Amukamara’s overall grade of 82.7 is the highest he has achieved in his seven-year career. The veteran corner has only allowed 82 yards after the catch and one touchdown on 46 passes thrown his way. Amukamara ranks inside the top-10 for yards per coverage snap (0.71), coverage snaps per target (9.9), and coverage snaps per reception (17.5). With the fifth-highest catch rate on passes targeted 20 or more yards downfield, Diggs has been one of the best deep threats in the league this season. Diggs ranks ninth with 11 receptions on such passes and his 309 receiving yards on deep passes rank 14th. T Mike Remmers vs. DI Akiem Hicks – Remmers will be in for a difficult day in the run game on Sunday when he faces one of the best run defenders in the league. Hicks ranks seventh among interior defenders this season with a run-defense grade of 88.8. Only Damon Harrison has more run stops than Hicks’ 35 this season and his run-stop percentage of 11.0 ranks seventh among 74 qualifying interior defenders. Remmers had a rough day out last week against the Packers, as he was one of the lowest-graded offensive tackles of the week with an overall grade of 39.4. He has played better in the passing game (77.1 pass-blocking grade) than in the run game (73.4 run-blocking grade) this season.